Review Samsung Gear Sport. The company knows what is sport? Gadget » Articles » Review Samsung Gear Sport. The company knows what is sport? As we expected, the Korean company Samsung will bring to the international exhibition of electronics a new model of “smart hours”. And so it happened. The company announced Samsung Gear watch Sport, which are the logical “sequel” to last year’s Gear S3. Sport version has the same round AMOLED display, the operating system Tizen OS, and, of course, a circular ring navigation. But let’s look at this model in more detail and try to understand that Samsung is the concept of “sport”. As I wrote in the beginning, Sport Gear is very similar to the previous year clock company Gear S3. But there are differences. So, building new models a few millimeters already. The rest of the body is made of metal, and the lower part is made of plastic, it is a heart rate sensor. In addition to the main body portion, where the watch itself, there are four tabs, which is attached to the strap. Initially I was a little familiar and it seemed that they will not interfere with wearing hours. But no. Fortunately, these projections generally are not felt in daily life. Samsung Gear Sport has a diagonal of just 42,9 mm, which automatically makes them convenient both for girls and for men. I think, to make the clock in the style of “unisex” and was one of the main tasks for the model with the prefix “Sport”. And as you know, the company is pretty good. The weight of this watch is 67 grams, on the hand, they are practically not felt. It can be considered as an advantage and a disadvantage, but small. As with last year’s release, you can use the technology of contactless payment Samsung Pay at terminals that support payment via NFC. On the right side of the body are two buttons. The top is responsible for the action “back”, and the bottom returns you to your dial. But if you are on the main screen with the clock, the lower button opens a list of applications. Buttons sit tight, not loose, which I was very pleased. Gear Sport have Super AMOLED-display with a diagonal of 1.2 inches and a resolution of 360×360 pixels. The colors are very bright and saturated, but generally not poisonous. The display is covered with protective glass Corning Gorilla Glass third generation, which is an advantage of this model. In addition, the display is mounted a few millimeters below the control ring, so scratch the display you will not succeed. Of course, if not the main purpose of all life. If we talk about brightness, there is a light sensor that are certainly well affect the time of Autonomous work. The brightness level you can adjust from 0 to 10, in addition, there is a search function where in bright sunlight the brightness level of the short-term can rise above the value “10”. This is done to ensure that even in the bright sun does not fade the color, and the user is not looking at the display of the gadget. As for the control ring, then I feel that the “teeth” are much smaller than on the same Gear S3. But the ring are all also quite comfortable to use. If someone does not know what it can be used to navigate the interface operating system. In order to “scroll” all the available screens, you will need about 24 spins of the wheel. Of course, you can use for this and the usual swipe across the sensor, but believe me, using the wheel to do it much easier. As the processor of the Samsung Gear Sport uses a proprietary chip Exynos 7270, which operates at a clock frequency of 1 GHz. Helps working processor, 768 MB of RAM. For devices of this class, more than enough. Flash memory 4 GB, with out of the box about half occupied by the system Tizen OS. Watch Gear Sport are able to distinguish between different types of physical activity, which include even swimming. By the way, at the expense of the water, this timepiece is protected by standard IP68 against moisture and dust. In addition, they can withstand pressures up to 5 ATM. There is a special function that disables the touch on the display when the watch is in water. But if you are under water you need something to click, to activate the display, you need to double click the home button. Unfortunately, I have not had the opportunity to check the quality of tracking such a load as swimming, but when I got to the clock in the gym, they instantly identified the following activity: running, squats and the elliptical machine. Every ten minutes the Samsung Gear Sport measure your pulse and record it in memory. But also have the opportunity to change the time after which the measurement takes place in cardiac rhythm. In General, I can say that the prefix “Sport” in this model hours not just. 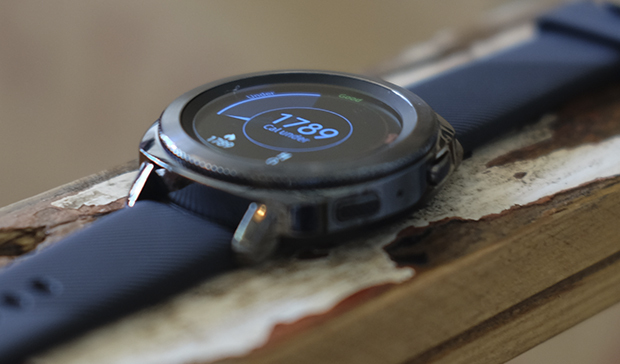 Automatic determination of physical, traceability navigation, measuring heart rate — make this watch really sporty, although the appearance a bit, not for athletes. In this watch is fitted with a battery capacity of 300 mAh. But despite this autonomy, I was pleased. In usage scenarios “above average”, and that means a lot of notifications, a bunch of active messengers and brightness on full, Sport Gear easily live two full days and a bit the next day enough. But in order not to lose their hours at the end of the second day, I always put them on charge. A little disappointed the bundled docking station: to charge the battery from 0 to 100% takes 2 hours and 40 minutes, which seems high for the battery 300 mAh. But since they do not need to be charged every day, it eliminates this drawback. As I wrote above, the watch are running a proprietary operating system Tizen OS 3.0. For those who have never used the system, I can only say one thing, the menu is more like your smartphone than a watch running Android Wear. Since I on a regular basis use the Huawei Watch, I thought that Tizen I don’t like it. But you know, there is no discomfort when using I didn’t have – it’s pretty intuitive and clear. The main menu can be accessed using the top button. Since the menu is made in the form of a circle, it is quite easy to move between the items with the navigation ring. To run an application just press your finger on the watch display. When the first clock synchronization with your smartphone you’ll need to install the app Sport Gear, and then download the plugin for your particular model. After installing the required programs you will have the ability to change the clock settings, alerts, download you need dials. In addition, it is through the application Gear Sport, download and install new versions of the operating system. In General, the operation of the system on a solid “five”, nothing slows down and does not cause a lot of questions. In this paragraph of our review is to note that Gear Sport there is no speaker to answer incoming calls. Most likely, this is due to the standard of protection of IP68. Smart watches Samsung Gear Sport — just a stunning watch that will allow you to monitor the health and physical activity. In dignity you can record the design, as despite most of the “sport”features, they can be worn with a simple suit. I never thought I’d say this, but the operating system Tizen OS is a bit ahead of Android Wear in ease of use and simplicity. In the end, I can confidently say that the Korean company really knows what athletes need. You are reading an article on the Review Samsung Gear Sport. The company knows what is sport?. All materials on the site Gadgets F, а также и статья Review Samsung Gear Sport. The company knows what is sport? - written for the purpose of information enrichment and we are happy if you like our magazine. Reviews to article Review Samsung Gear Sport. The company knows what is sport?